Reno or let it go?...what to do before you sell. I often have clients ask me…should we replace our floors before we list?...should I buy new appliances?...should I paint? Will it be a good investment and will I get my money back on the sale? All very good questions. And I guess the shortest and easiest way to answer this is…it depends. Super helpful, I know. But it’s actually true. So to help you to decide if you should roll up your sleeves, open your cheque book and get to work, or perhaps just slap the for sale sign on the lawn and call it a day…I’ve put together this useful list of considerations to help you make the decision and prioritize your projects. Not all of us are financially fluid enough to be able pull off a major expense right before we sell. Let’s face it…sometimes we’re selling to get ourselves out of a financial jam. Maybe your upsizing, and are busy pinching your pennies just to be able to come up with the deposit for your next purchase. Whatever your situation, unless it’s absolutely necessary, don’t start throwing cash you don’t have at renovations that may or may not net you more money on your sale. 2. How critical are renovations, repairs, or updates to your sale? Consider first how your current floors, paint, counters, etc. will be seen through the eyes of a buyer. Are your carpets heavily worn and stained beyond cleaning? Are your appliances clearly on their last legs, mismatched in colour and style? If the deficiencies you’re concerned about stand out like a sore thumb and it would be obvious to any average buyer that improvements will be necessary as soon as they move in, then maybe it’s not a bad idea to consider a few small projects. Though there are some buyers that really want a home improvement project they can sink their teeth into, the vast majority of buyers prefer a move-in-ready home, with the option to maybe make improvements down the road, if and when they wind up having enough time and cash. And the reality is that these are the projects that almost never get done anyways. What you want to avoid is a buyer starting to add up the dollars they’re going to need to spend as soon as they move in. Unless you’re priced accordingly, they’ll wind up turning around and head straight for the door. But if your appliances are older but still in pristine condition and have years of life left in them, chances are that buyers will see that as well. 3. Make the greatest impact for the least amount of money. The real objective when renovating for sale is to spend just enough to make a substantial difference…no more. 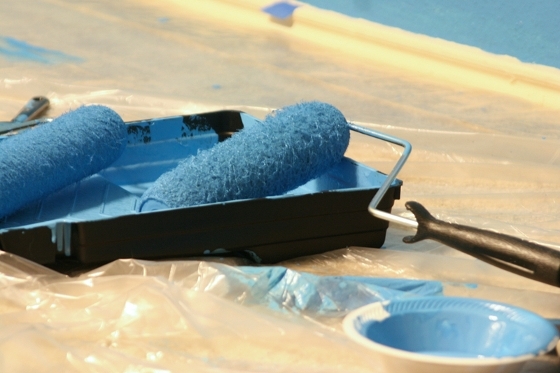 Usually, the projects that tend to have the most bang for their buck are painting, new floors, countertops & appliances. But this isn’t always the case…it varies from home to home. Tour your home through the lens of a buyer who is first visiting. Try to determine which features and finishings they may have specific objection to and/or which features are in particularly poor condition or a state of disrepair. This will help direct you to where to start. Bite off the worst ones first, and usually, that will be all you’ll need to do. 4. Don’t let updates backdate you. Market conditions and seasonal shifts can have a huge impact on when you and your listing agent decide to list your property. In many cases, timing is everything. What if a planned reno project ends up pushing your list date well into the summer months or til 3 weeks before Christmas? Consider how this will impact your marketing abilities and whether or not it might be worth the time and money spent on your last remaining reno project. Sometimes, there’s no time like the present. And maybe that means that you just have to let it go. 5. Match surrounding style and condition. Honestly, what’s the point in installing brand new granite counters on top of 30-year-old roughed-up base cabinets, with the same-old flowered backsplash tile? C’mon people! Seriously though, the trick is to make the style of each project consistent and not look out of place. If the cabinets are old, but still in great shape, there’s nothing wrong with updating the style with new door pulls, new counter and new simple backsplash. But whatever you do, just make sure it looks like it was well planned. Not an afterthought. As a listing agent, I have an opportunity to see many homes at the pre-, pre-, pre-listing stage. Hardly anything surprises me anymore. But the thing I always find somewhat humorous is when I walk into a home that is ripe for an entire gutting (I mean basically everything has to go), and the homeowner asks me if they should replace the countertops. Sometimes, you just need to face the facts that almost any buyer for your property would be planning to do a complete reno, top to bottom. In these cases, there’s nothing wrong with owning it, and just selling it that way. Buyers will appreciate that you didn’t waste time or money trying to improve the property with half-hearted projects using budget materials. It’s a real shame when a buyer says to me, “It’s too bad they just put these new floors in, because they’re really not our style and we’re just going to have to rip them up anyways when we gut the kitchen”. Just save them from having to feel guilty about it, right from the beginning. 7. Consider what buyers are looking for in a home like yours? Whether you’re selling an entry-level 1 bedroom condo, or an upscale 3 bedroom townhouse, consider your buyer market. The quality of workmanship and materials used should match consumer expectations. If you exceed local standards in quality, it will look fantastic. No question. But you’ll blow the bank doing it and will never recover the money you spent. One the other hand, if your renos fall short, not only will you have a hard time recovering your money, but it could seriously impact your ability to sell your property. Regardless of the nature and scope of the renovation projects you may have in mind, do yourself (and your bank account) a favour and talk to your Realtor first. It never hurts to have a second opinion, and it may save you a whole lot of money, time and headaches. The reality is that a little good ‘ol professional home staging can go a long way to turn a buyer’s attention to all your home’s awesome features and away from your own personal perceived list of home improvement projects….but I digress, and we’ll save that blog for another day. For now, as a general rule, don’t make any improvements just before selling. Unless of course they are absolutely necessary, and leaving them alone will have a substantial negative impact on your sale. Spend as little as possible, and only on key projects that will have the greatest impact. And always, always consider your market. So when you ask your Realtor if your should reno before you sell, don’t be surprised if they start their reply with…”well, it depends”. For more information on this, other real estate questions, and/or for a complimentary assessment of your home, feel free to contact me directly at 604-787-1581 or mike@mikekennedy.ca.